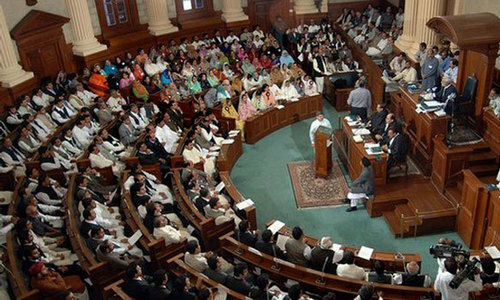 LAHORE: Punjab Education Minister Rana Mashhood Ahmad has written a letter to National Accountability Bureau chief Qamar Zaman Chaudhry complaining him about Lahore bureau’s ‘harassment’ of his political (lady) workers and summoning of his family members and friends in the inquiry against him. “My personal friends, family members and political workers are being summoned by officials of NAB in Lahore who make them sit in their offices for hours. Even political lady workers are harassed by asking them derogatory questions,” he said. The minister asked the NAB chief as why the bureau had failed to complete the inquiry against him in a stipulated period of six months. “As per standard operating procedures of NAB, every inquiry has to be completed within six months whereas 11 months have elapsed and I am still clueless about inquiry against me. Failure to provide copy of complaint/gist of allegations to me and then calling me to join inquiry and investigation is something against the mandate of law. Without informing me of the allegations, I am deprived of the right to have an opportunity of due process of law and fair and impartial inquiry and investigation,” he said. Mashhood said he received a notice under Section 19 of National Accountability Ordinance, 1999, in which an allegation pertaining to a video clip was mentioned. In response to this he appeared before the inquiry officer and gave his statement. “After that NAB started issuing notices to different offices seeking information about myself, family and projects conducted by me,” he said, adding he also filled an assets pro forma. The minister also talked about irresponsible behaviour of NAB Lahore Director General Syed Burhan Ali, a retired major, by appearing in different TV talk shows stating that NAB had started proceeding against him. He said he had already filed a complaint against Mr Ali in the bureau. “I already requested provision of the gist of allegations (against me) and also complained about conducting of inquiry beyond the provisions of National Accountability Ordinance, 1999. It is a fundamental right of every citizen to know about allegations levelled against him,” he said, adding issuance of notices under section 19 of National Accountability Ordinance to witnesses and to him showed “bias” in the mind of NAB officials as no notice could have been given at probe stage. The minister requested the NAB chief to look into the matter personally to make the proceedings transparent and ensure compliance of law in letter and spirit and redress his grievances. NAB has been investigating a video clip showing Rana Mashhood allegedly receiving money for his party (PML-N) fund from Asim Malik, owner of a visa consultancy firm, at his house a few years ago and alleged corruption in the Punjab Youth Festival and entries of ‘fake record’ in the Guinness Book of World Records. “Why NAB is taking too much time to conclude the inquiry against Rana Mashhood. It is giving a clear impression that NAB has been either under immense pressure from the federal and provincial governments or has some other issues in this case,” a former NAB official remarked.